We’d love your help. Let us know what’s wrong with this preview of The Power of One by Bryce Courtenay. To ask other readers questions about The Power of One, please sign up. What age group is this book?? Are there any sexual references?? I know some people have said it's not school appropriate because of the profanity. Could someone please verify? Who is Peekay? I am really confused. Is it the author. I fell in love with Peekay even 'before' he was five years old, starting in South Africa, when he shares of being nursed from his lovely black nanny before being sent to boarding school. ( although we follow him from age 5 to 20 - from the late 1930's to mid 40's). Our oldest daughter attended a boarding High School in Michigan for a short time -an academic/arts school. The family separation was painful. I can't begin to imagine sending a 5 year old away to a boarding school Wow... incredible!!! Our oldest daughter attended a boarding High School in Michigan for a short time -an academic/arts school. The family separation was painful. I can't begin to imagine sending a 5 year old away to a boarding school even in the 'best' of conditions. And the fact that this story is inspired by the authors real life....for me, this is one of the most wrenching parts of the entire book...."being sent away from his family at age 5 -- from 'love' he was receiving to 'hatred' he was walking into. Peekay is bullied and abused almost immediately upon arrival as a 5 year old at his boarding school. He's the youngest child in the school. Missing the comfort of his Black nanny ( Peekay is English and white), who would soothe his hurts...missing his mother who was sent away due to a nervous breakdown, Peekay was the first live example of the congenital hate they carried for his kind. "The Boer War had created great malevolent feelings against the English, who were called the 'rooineks'. It was a hate that had entered the Afrikaner bloodstream and pocked the hearts and minds of the next generation". Given that Peekay, spoke English, he pronounced sentences that killed their grandfathers and grandmothers to the world's first concentration camps. Little Peekay had no advance warning that he was wicked before coming to the school. One of the other kids - called 'Judge' abused Peekey regularly. Peekay even made a deal with him to do the Judge's homework and make sure he didn't fail-- but he still continues to abuse him. - really 'tortured him. "One thing got to them more than anything else. They could make me cry. Even the Judge, with all of the fear he could provoke, could not make me cry. I suspect they even began to admire me a bit. Many as them brothers my age at home, and they knew how easy it is for a five-year-old to cry. In fact, I had turned six but nobody had told me, so in my head, I was still five". "Not being able to cry was the hardest part for me as well. Crying can't be a good camouflage. In truth, my willpower had very little to do with my resolve never to cry. I had learned a special trick and, in the process, had somehow lost the knack of turning on the tap". Peekay is a diamond in the rough....an inspiring character. He's smart, open minded, and doesn't have an ounce of bitterness or hatred in him. He develops meaningful friendships with teachers and mentors who teach him to read. He meets a healer, and a boxer. We learn a tremendous amount about boxing. We also learn a lot about the history of South Africa through the eyes of a child. The themes of discrimination were well defined by the author: the Boers vs. the English - South Africans vs. the Germans - the Jews vs. the Germans - white Africans vs. the Black Africans. Violence is graphic - so be warned. It's a cruel and beautiful world we live in! Audio version with introduction by the author himself. He is such a larrikin with a happy voice. Bryce Courtenay's debut, apparently toiled over at the kitchen table with his son's girlfriend stating "This is the best book I've read, you need to publish it" or words to the effect. The rest, they say, is history. "First with the head, then with the hands" What an Australian classic, one that I should have read by now. Peekay starts out as a tiny tot (I have a 6 year old son and therefore horrifie Audio version with introduction by the author himself. He is such a larrikin with a happy voice. Bryce Courtenay's debut, apparently toiled over at the kitchen table with his son's girlfriend stating "This is the best book I've read, you need to publish it" or words to the effect. The rest, they say, is history. Peekay starts out as a tiny tot (I have a 6 year old son and therefore horrified) who suffers dreadful abuse at this young age at boarding school, at the hands of horrible older boys, one in particular. Emerging a wonderful, well rounded and amazing human being. Memories of his beloved wet nurse, neurotic mother and beloved music teacher and mentor; this is an epic story centring on the discipline and craft of boxing. South Africa is a sometimes bleak and beautiful place, told from around the time of 1930-1940. Worthwhile reading. Amazing narration. 29/03/18 Addendum. I stumbled across notes taken during my audio read, so I have some more thoughts. There are too many sweet and wonderful comments from Peekay, I must purchase the hard copy, it would be a valuable asset to any bookshelf. Peekay’s grandfather, I loved reading these parts between the young and the old: "There’s a good lad.” Tap tap. Stroke ” goes Grandfather’s pipe process. Peekay’s perception: “Very high up born again Christian” ” This was so humorous with the full on nature of Peekay’s mother, so worried about the ranking of all this stuff! Those who have not experienced a Bryce Courtenay novel are in for a treat with this piece. Not only does the reader have the opportunity to experience Courtenay’s first foray into writing but also experience his unique style, which combines well-developed characters with a plot that is rich with detail. Some may find his writing to be both excessive and too much to digest in a single novel, but it is this that makes the books even more enjoyable. Courtenay uses an interesting formula in his writing, which the attentive reader will discover as they meander throughout his novels, this one being no exception. There are scores of characters who cross the pages, each serving to develop their own backstory and to offer a slice of character revelation for the protagonist, Peekay. While the reader will notice strong ties between Peekay and one character in the early portion of the book, that individual will soon vanish, though their life lessons and impact are felt throughout the rest of the story. Courtenay inundates the reader with names and characteristics, which may cause some to stumble or require crib notes, but, rest assured, it is well worth the temporary confusion. Having read all of Courtenay’s novels, I can see character themes that reemerge, including token characters of a variety of backgrounds. The story itself becomes a tale full of twists and turns, such that the path on which the narrative is leading the reader soon changes, leaving what one might have expected to be left in the proverbial dust. This is also something that some may criticise, but I find this serpentine journey to be refreshing and forces the reader to remain engaged, rather than skim through parts of the story. As Courtenay calls this piece his loose attempt at a fictionalised autobiography (yes, the dichotomy of the statement is not lost on me), the historic moments and struggles are more than conjured up dramatisations from world events, but actual experiences that Courtenay felt. One can only imagine the strife in which South Africa found itself in the late 1930s and into the 40s. The Afrikaner population is still smarting as they are being regulated by the English, but they, too, have developed a sense that, perhaps, Hitler can come to save them and return the land to the rightful Boers. Peekay feels this throughout the novel, an English boy tossed amongst the strong-willed Afrikaners who look down upon him. However, there is also the theme of brewing apartheid, which has been loosely permitted for decades already. Courtenay’s narrative shows the subjugation of the black population and the brutality that is inflicted upon them. While I do not condone this whatsoever, I have always been very interested in the apartheid mentality and how the Afrikaners justified it to the world. Courtenay offers up a front row seat to the reader, hoping they will better understand what went on. As an aside, the book’s publication came just as the grip of apartheid was loosening, so it may be an educational piece to those who could not fathom the true horrors of the policy as it gained momentum and became a way of life. It is this sort of depth that has drawn me to all of Courtenay’s books, as he offers more than a superficial look at the world, which entertaining the reader. True, his books are long and tangential, but, like a well-paced journey, they permit the reader to gather many wonderful nuggets of information from page to page. As a friend commented to me recently, the story ends somewhat abruptly and has no strong sense of finality. Therefore, I’ll rush to get to the sequel, Tandia , to continue the exploration of Courtenay’s Africa. Kudos, Mr. Courtenay, for such a stupendous piece. Re-reading this book has solidified why I consider it one of my favourites and a book I’d surely pack for an island isolation. This book fulfils Topic # 3: Island Reading in the Equinox #3 Reading Challenge. ‘ The Power of One’ tells the story of 5 year old Peekay. A white English speaking South African boy,on his journey of self discovery, enlightenment and empowerment. Set in South Africa during the 30s and 40s. Peekay at the tender age of 5 is sent off to boarding school after his mother suffers a nervous breakdown . He must leave his beloved black nanny behind who has been his wet nurse since birth. At boarding school Peekay is mercilessly bullied by ‘The Judge’ and the Boer boys for his English heritage. On the train back to see his Grandfather he meets conductor Hoppie Groenwald an amateur boxer. Hoppie teaches Peekay that little can beat big. Hoppie is such an inspiration to the bullied Peekay, he decides one day he will rise up to be the Welterweight champion of the world. What follows next as Peekay grows up is a series of friends and mentors that each help Peekay on his journey of discovery ..in the power of words, the power to transform people and just what IS the power of one. ‘The Power of One’ is so much more than a story of one small boys coming of age. All the mentors and friends that lovable Peekay encounters growing up each play a part in how he transforms from a bullied child into a determined, well respected and much admired adult. Anyone who has ever felt bullied, downtrodden or undermined is in for a treat as you the reader follow Peekay’s extraordinary journey of empowerment. Thank you for your truly inspirational novel. You have given the world an ‘absoloodle’ wonderful gift. Of all the books I read in 2009 one stands out in the horizon of my memory, a mass market paperback with 540 pages of microscopic print which I devoured in a day and a half. The Power of one gave me the chance to meet a part of myself that I thought I had lost forever. It rekindled a long extinguished flame of hope, it awakened a lost feeling of wonder, it gave me proof that one can make a difference. Set in South Africa in the 1930s and 40s , The Power of one is the compelling coming-of-age story Of all the books I read in 2009 one stands out in the horizon of my memory, a mass market paperback with 540 pages of microscopic print which I devoured in a day and a half. Set in South Africa in the 1930s and 40s , The Power of one is the compelling coming-of-age story of "Peekay", an innocent English boy who very early in his life realizes that there are greater things at stake than the hatred between the Dutch Afrikaners and the English. The Second World War in Europe, the growing racial tensions and the beginning of Apartheid will influence his world and challenge his spiritual strength. Even though the odds are stacked against small Peekay from the start, he never loses faith in the goodness of people and following the advice of several improvised but memorable mentors who will change his life, he becomes an improbable icon in boxing which will make history. Reading this book felt magical, the story was touching in so many different ways that sometimes I had to stop reading, overwhelmed by the details and the tenderness I felt for this pure little boy who made a turbulent and full of hatred world shine with his goodwill and with his mysticism. I hardly know where to begin writing this review. This book had been on my to-read list for a long time. I finally decided to take the plunge and listen to the Audible version, narrated by the fantastic Humphrey Bowers (who really brought SHANTARAM to life also). And now it's over. Twenty hours spent getting to know the wonderful Peekay, and now I'm done? This is one of those books that isn't really over when you finish it. It stays with you and the characters live on inside your head.That's rea I hardly know where to begin writing this review. This book had been on my to-read list for a long time. I finally decided to take the plunge and listen to the Audible version, narrated by the fantastic Humphrey Bowers (who really brought SHANTARAM to life also). And now it's over. Twenty hours spent getting to know the wonderful Peekay, and now I'm done? This is one of those books that isn't really over when you finish it. It stays with you and the characters live on inside your head.That's really the highest compliment I can pay a book. The story is so hard to describe without making it sound simplistic. It is a coming of age story, a tale of friendship and history and love. It's the kind of book I already know I will find myself recommending to all sorts of people. I can see it appealing to young and old, men and women, which is a rare thing to come across. There is such humanity and thoughtfulness in this story, it's got humor, but a great depth, too. Since it is told by a boy, growing into young adulthood, he sees a lot of the political and social strife of the South African people though the eyes of a child, which adds such a strong emotional element to the story. I feel a bit at a loss now, and don't quite know what to pick up next. I think it will have to be something entirely different, for it to have a chance, and for me not to compare it unfavorable to THE POWER OF ONE. Needless to say, once I have let some time pass for this story to sink in, I will be seeking out Bryce Courtenay's many other books. I only wish I could write to him, and tell him how much I enjoyed his book, sadly he passed on two years ago. As I understand it, this story was largely autobiographical, which makes it that much more fascinating. Highly recommended!! Took me some time to read, but not because it wasn't good, but just because there is so much to this story. A supremely well written book! If you like historical fiction - the type focused on people living in certain historical eras, not necessarily specific historical events - you will enjoy this story. I now feel like I have a good feel for WWII era South Africa. Also, if you like interesting characters and good character development, this is a good story for you, too. Normally I refrain from writing long reviews, but this wonderful book offers so much to readers, that I must indulge. It is a broad sweeping book about rural South Africa, set in the late 1930s and 1940s prior to apartheid. It imparts a real sense of this exotic country and the friction between its diverse peoples: Dutch Afrikaners, native Boers, a host of black tribes, and the English. The protagonist Peekay is an only child, sent to boarding school at age 5 when his mother is institutionalized. Normally I refrain from writing long reviews, but this wonderful book offers so much to readers, that I must indulge. It is a broad sweeping book about rural South Africa, set in the late 1930s and 1940s prior to apartheid. It imparts a real sense of this exotic country and the friction between its diverse peoples: Dutch Afrikaners, native Boers, a host of black tribes, and the English. The protagonist Peekay is an only child, sent to boarding school at age 5 when his mother is institutionalized. He is picked on mercilessly because he is youngest and English, and misses his black nanny. His nickname is Pisskop (pisshead) as he wets his bed. Peekay's only friend is a rebellious chicken. Things take a change for the better, when he is sent by train to his grandfather's distant home. He is adopted by conductor, Hoppie Groenewald, who cares for him and teaches one of this book's life lessons: "first with the head, and then with the heart." Hoppie is an amateur boxer, and uses his prodigious skills to beat a much larger opponent at the end of the first leg of Peekay's train journey. Peekay immediately develops a deep passion for boxing and decides he wants to become the welterweight champ of the world. Arriving at his grandfather’s home, Peekay is devastated by the disappearance of his nanny and subjected to his mother's religious fervor. Once again, Peekay is rescued by a mentor, Professor Karl von Vollensteen (a/k/a Doc),whom he meets on a distant mountaintop. Doc too, adopts Peekay, and teaches him about botany, especially cacti, piano, Africa, and of course, life. As a German, Doc becomes jailed as a possible spy, but becomes a popular figure in the local prison, with inmates, guards, and the Commandant. Meanwhile, Peekay visits Doc regularly, and eventually convinces the staff to allow him to train as a boxer. The downtrodden criminal, Geel Piet, teaches Peekay how to box and they develop a symbiotic relationship, as Peekay smuggles tobacco into the prison. Peekay and the local town librarian also start a postal service for the mostly black inmates. Peekay's open-minded acceptance of others, accords him a mythical status with the African people in the prison and community, and he becomes revered as the "Tadpole Angel", creating a large following as his boxing career advances. What a nice surprise this book was for me. This coming-of-age story set in 1939 South Africa has a focus on the sport of boxing throughout, which I am generally not a fan of, but certainly loved every minute of it in this story. Peekay endures awful humiliation and abandonment at such a young age yet he struggles along through adversity and heartbreaking losses. A touching and up-lifting story I plan to read again. Absoloodle! (you'll have to read the novel to appreciate that one) Highly recommend! I read THE POWER OF ONE 8 years ago, and the story and messages of the novel continue to resonate with me still. This is such a powerful journey of character, courage, and self. I would read this book again in a heartbeat. Truly amazing. This is the story of Peekay, a frail, young, English boy growing up poor in South Africa and of his refusal to be demoralized by the racial torment surrounding him. On the road to becoming a young man he cultivates some uniquely, diverse friends and discovers many truths, not the least of which, are that loyalty, strength, love and compassion, coupled with a insatiable, thirst for knowledge and armed with the focus and courage to stay true to one's own self, can all be fused together, thus harnessing a power so potent that any worthy goal can and will be achieved. For me the message that rings out loudest and clearest in this story is how ridiculous racial hatred truly is. This review has been hidden because it contains spoilers. To view it, click here. This book is a wonderful story of the hope and success of an underdog, of relationships breaking barriers of race, age, religion, wealth, and of a boy learning who he is and who he should be. I would really like to rate this book a 4.5. I loved about 500 pages of this book, but was disappointed with the ending. ***SPOILER ALERT*** For most of the book I really thought, this could really happen. And then, to make a "nice ending", of course it all comes full circle in the end and the frayed ends a This book is a wonderful story of the hope and success of an underdog, of relationships breaking barriers of race, age, religion, wealth, and of a boy learning who he is and who he should be. I would really like to rate this book a 4.5. I loved about 500 pages of this book, but was disappointed with the ending. One of my favorite books! This is a truly inspirational historical fiction about of boyhood in South Africa at the birth of apartheid. Follow the life of a British child who comes of age amidst resentful Boers who are recovering from their own persecution while simultaneously championing the causes of Hitler in Germany. This precocious boy struggles to understand the clash of races and racism while simultaneously overcoming boundaries through the medium of competitive boxing. One perhaps could ma One of my favorite books! This is a truly inspirational historical fiction about of boyhood in South Africa at the birth of apartheid. Follow the life of a British child who comes of age amidst resentful Boers who are recovering from their own persecution while simultaneously championing the causes of Hitler in Germany. This precocious boy struggles to understand the clash of races and racism while simultaneously overcoming boundaries through the medium of competitive boxing. The Power of One is a semi-auto biographical coming of age story set in South Africa during the 1940’s. PK is an English boy who endures a great deal of abuse from the Boer children, some of whom are Nazi sympathizers until he is taught to box. He is an exceptional student who later befriends Doc, a German professor who is a great pianist but who is confined to the local prison for the duration of the war. The professor teaches PK many valuable life lessons including the piano but boxing and exce The Power of One is a semi-auto biographical coming of age story set in South Africa during the 1940’s. PK is an English boy who endures a great deal of abuse from the Boer children, some of whom are Nazi sympathizers until he is taught to box. He is an exceptional student who later befriends Doc, a German professor who is a great pianist but who is confined to the local prison for the duration of the war. The professor teaches PK many valuable life lessons including the piano but boxing and excelling at schoolwork remain his true passions. This is a great novel for the first 2/3 of the book essentially covering the period when PK is age 5 to 12. PK is the ultimate underdog throughout the first half. He becomes a local boxing champion and always displays a great deal of humanity towards Zulus and seemingly anyone who is not part of the power structure in those awful conditions that made up Apartheid. Returning home from boarding school to live with his grandpa and mother, PK first meets and later visits Doc at the prison when he is incarcerated. PK knows three languages which is uncommon even for adults. With the help of the professor and Geel Piet, a Zulu prisoner with a huge heart, PK helps smuggle letters in and out of the local prison. Along with his boxing prowess he becomes a real hero to the prisoners. This does not escape the notice of some of the racist guards although they don’t suspect PK, one guard does suspect a clandestine activity. There are incidents that follow that are quite sad and I won’t spoil but rest assured the incidents are masterfully told. The last 1/3 of the book covered PKs teenage years into young adulthood and for me were not as interesting. The child like innocence and wonder were gone after age twelve and the end of WWII. I think the story would have been perfect if he had ended there. Bryce Courtenay, the author, was a truly gifted writer and there are some truly beautiful passages in this novel and many valuable life lessons. I probably learned more about South Africa from this novel than any history book on Apartheid or the Boer War that I ever read. The Power of One is at its simplest, a story of self-reliance and perseverance in times of hardship and struggle. The story follows Peekay from childhood through his young adult years, including his schooling, his pursuit of boxing, and his odd collection of enemies, friends, mentors and teachers. The book is long, and it took me quite a long time to get into the story. It was a commitment, particularly because I found the pace of the story to be slow and full of (somewhat unnecessary) detail ea The Power of One is at its simplest, a story of self-reliance and perseverance in times of hardship and struggle. The story follows Peekay from childhood through his young adult years, including his schooling, his pursuit of boxing, and his odd collection of enemies, friends, mentors and teachers. The book is long, and it took me quite a long time to get into the story. It was a commitment, particularly because I found the pace of the story to be slow and full of (somewhat unnecessary) detail early on, but once I did finally get into it, The Power of One was quite good. "The Power of One" is the story of the childhood and adolescence of a South African boy, Peekay. Set in the 1940s, the earlier Boer War, World War II, and apartheid all effect the relationships between the characters. After English Peekay was taunted cruelly by some Afrikaner (Boer) boys at a boarding school, he made it his goal to become the welterweight champion of the world someday. His first boxing mentor, Hoppie, advised him, "First with the head and then with the heart, that's how a man st "The Power of One" is the story of the childhood and adolescence of a South African boy, Peekay. Set in the 1940s, the earlier Boer War, World War II, and apartheid all effect the relationships between the characters. After English Peekay was taunted cruelly by some Afrikaner (Boer) boys at a boarding school, he made it his goal to become the welterweight champion of the world someday. His first boxing mentor, Hoppie, advised him, "First with the head and then with the heart, that's how a man stays ahead from the start." Doc, a German music teacher and naturalist, plays a father figure and good friend to the precocious young boy. Doc teaches him about observation and logic. Doc can also see mystical or spiritual expressions in nature and music. After helping some black prisoners with Doc and his colored boxing coach, Geet Piels, Peekay becomes a symbol of hope to the black South Africans. Peekay is generous in spirit, and compassionate toward those who are mistreated by prejudiced people. "The power of one", the spirit inside Peekay, becomes stronger during adolescence, allowing him to create his own destiny. He takes a lucrative, but dangerous job to earn money to pay for university tuition. The book comes around full circle as Peekay resolves his childhood abuse and forges ahead into the future. When talking about The Power of One, it is easy to be distracted by "the power of one" itself and place ultimate importance on Peekay's slippery personal philosophy. But to do so to the exclusion of all else but racism is to read only a small portion of Bryce Courtenay's masterwork. The Power of One also deals with class, religion, science, obsession, faith vs. reason, objectivism, homosocial intimacy, and in one of the finest literary expressions of its kind, the importance of violence. Peekay's When talking about The Power of One, it is easy to be distracted by "the power of one" itself and place ultimate importance on Peekay's slippery personal philosophy. But to do so to the exclusion of all else but racism is to read only a small portion of Bryce Courtenay's masterwork. Peekay's use of violence is controlled and seemingly benevolent, but he doesn't just use violence, he needs violence. It is the very basis of his obsession with becoming the Welterweight Champion of the World. It is at the root of everything he fights for and against. And it is the question and the answer to the defining struggle of Peekay's life. One need only look to the final pages of The Power of One for the answer to the question. Peekay savagely destroys Botha, the Judge that started him on the road to violence; while Peekay is violent in self defense, he perpetrates his violence with a ruthlessness and controlled savagery that dwarfs any of his childhood persecutions at the Judge's hands. The final, brutal mutilation of Botha -- an act that likely raises few eyebrows amongst readers directed as it is at a symbol we consider pure evil -- is an overtly violent catharsis that brings peace to Peekay's spirit (but not an end to his need for violence). It is difficult to see Peekay's conquering of Botha as anything but just. Not only is Botha responsible for the abuse that dehumanized Peekay as a child (although Botha was a child himself at the time of the abuse) and about to take Peekay's life, but Courtenay overdetermines Botha's desert by making him a branded acolyte of Adolph Hitler, a Nazi racist who is apparently beyond redemption. But beneath and behind this easy rationalization of Peekay's violence is an important commentary on our need for violence. Violence isn't something that we need to erase from human behavior because we actually need it -- especially on a personal level where it is most in danger of being sterilized from our lives (already it is only an appropriate response in our popular mythology). Violence is something we need to control and embrace and realize is part of who we are as humans. Violence is essential to both men and women. Violence is an integral part of our humanity. Violence of the kind Peekay engages in against Botha serves several purposes: it is defensive; it is purifying; it is redemptive; it is responsible; it is empowering; and it is healing. Many find themselves supporting Peekay's actions without a second thought. But were a similar situation to play out in our North American reality, Peekay would find himself going to prison for a very long time, and most would agree that while he was defending himself at first, Peekay took things too far and deserves to be punished. Amongst its many concerns, The Power of One tells us that we need to reconsider our personal relationship with violence. It reminds us that we need to keep violence as a tool of our own, rather than passing it off as a tool for our governments, our armies, or any other persecutors who may use it against us. And so long as we use violence "first with our head, then with our heart" it can lead to positive change. 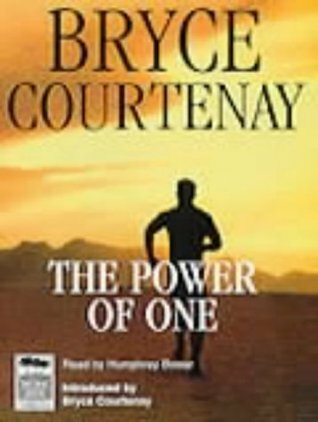 Review of Audio book, The Power of One written by Bryce Courtenay, Narrated by Humphrey Bower. This has been both a Hard and Easy review to write. The Power of one is a wonderful autobiographical novel which has been made into a fantastic audio book. Astonishingly this was Bryce Courtenay debut novel. Humphrey Bower is both experienced and gifted narrator and the perfect pick as he is able to pull off a convincing South African accent. Hard to write up as it has so many powerful, tender and tanta Review of Audio book, The Power of One written by Bryce Courtenay, Narrated by Humphrey Bower. Hard to write up as it has so many powerful, tender and tantalising elements and so it would take too long to list them because they all hold real and cultural relevance. As with all good books which have a strong human element, each reader draws from their own life experiences to relate with the story. The richness of the main character PK whose we meet at a tender age and go on to experience though his thoughts, all his life with its joy, muddles and harshness. The story is set against the dramatic back drop of Africa at a historically rich time. The wealth of this very personal and at time humorous while being startling graphic book, will have something in it that will not fail to touch even the hardest of hearts. As for myself the telling of the bond of friendship between the five year old PK and his chicken, Grandpa Chuck, hit the most me with stiff resonance. This was because I was midway through the audio book at the time I had heard about my dear old springer spaniel Mandy, fatal illness. Bryce writes superbly throughout the book but this connection with his unusual animal friend, the love and respected trust with his chicken hit me the hardest because of my best friend Mandy. PK’s other friendships of the human kind were each different and thought provoking and described in skilful detail, that I felt as if I had had known, loved, grieved or feared them. As each of them where introduced into the thick of the story and at times had left, sometimes abruptly! I was span though a range of emotions, catching my breath with sadness, peace or fear. It would be hard to pick out the best of them as they are all best! Even the baddies as they made the goodies appear more courageous and strong hearted, and so the story would not have been the same without them. Easy to praise this audio book as not only the writing of this story is superb but the narration by Humphy Bower, who’s expressive warm voice transcends the normal narrator with his rich repertoire he narrates the characters with a ‘pull all the stops out’ experience. The sheer spender at which he brings to life the delicacy and rawness of each of the marvellously complete characters and soulfully describes breathtakingly beautiful scenery with jaw dropping emphasis. So much of the landscape of Africa is written about and from so many viewpoints. I knew it was a hot climate but I learned of the coolness and darkness of the night. I was surprised by differing landscapes, the cactus garden, rose garden and magical crystal cave, which were described and narrated so colourfully and bountifully that I could see them in full spender when I closed my eyes. In this book the landscape of the peoples of Africa where explored and described, with a strong emphasis showing how important music and the connection to their land was. PK the hero of the book is a true hero a fighter who yearned for knowledge but was not mean spirited and keenly shared with all. This book was a humbling experience. As a writer myself I became completely in ore of Bryce’s skill whose writing talent is pure genus. What a travel! What an adventure! And all without leaving my small flat and from the safety of my sofa with my best friend Mandy sat by me! What a gift this book is! An absolutely wonderful read with amazing characters. South African historical fiction. Highly recommended. I firmly believe that a book or a movie can be about absolutely anything as long as its well written. There are a few sports movies out there that I have enjoyed, that I got wrapped up in, all because what they were really were was just good stories. This is a book like that. If you do happen to read the back cover, you will learn that the book is about boxing, but it's hardly just about boxing. Saying The Power of One is only about boxing is like saying doing well in school is only about showin I firmly believe that a book or a movie can be about absolutely anything as long as its well written. There are a few sports movies out there that I have enjoyed, that I got wrapped up in, all because what they were really were was just good stories. This is a book like that. If you do happen to read the back cover, you will learn that the book is about boxing, but it's hardly just about boxing. Saying The Power of One is only about boxing is like saying doing well in school is only about showing up to class. Well, bad analogy, but you get my point. The book is overly sentimental at times, but is so well written that that is easily forgiven. Bad things happen to Peekay, but the reader quickly realizes that all will work out in the end. The question is how. The book is so beautifully written that the rather basic story line of a poor kid with a big dream fighting his way to the top by staying honest becomes a truly unique tale that will stay with you long after you've put the book down. I've read this book three times and each time it's as good as the previous read, if not better. A semi-autobiographical novel, Bryce Courtenay's The Power of One is set in South Africa immediately before, during and after WWII. The novel's protagonist is Peekay - just Peekay - who is, in all respects, a remarkable young man. The story begins when Peekay is 5 years old and ends when he is 17, but the 12 years covered are formative; although we don't know what lies in store for Peekay by the end o I've read this book three times and each time it's as good as the previous read, if not better. A semi-autobiographical novel, Bryce Courtenay's The Power of One is set in South Africa immediately before, during and after WWII. The novel's protagonist is Peekay - just Peekay - who is, in all respects, a remarkable young man. The story begins when Peekay is 5 years old and ends when he is 17, but the 12 years covered are formative; although we don't know what lies in store for Peekay by the end of the book, we know he will carry the experiences of his boyhood with him for the rest of his life. Young Peekay is a white child of British heritage growing up in South Africa after the British absorbed the Boer republics into the British Empire in the early 1900s after winning the second Anglo-Boer War. The Boers, who speak Afrikaans, and the British, who speak English, spend a lot time looking down on each other, both both group look down on black South Africans, who speak many languages. Peekay learns to speak all the languages, which of course is symbolic of his uncommon ability to find a way to relate to and communicate effectively with so many other human beings throughout the book. He is treated horribly at times but somehow manages to meet some extraordinary people who help him in his endeavor to grow up. The rich character development is my favorite aspect of this novel. At least 3 people I know have told me that this is their favorite book, so I just had to give it a read. It is really, really good. The book follows a young man, Peekay, as he grows up in South Africa in the 30s and 40s. He meets a series of very influential adults and is constantly being shaped by them and also by his many differing experiences growing up. The one theme that stays true throughout is his desire to become the welterweight boxing champion of the world. This is the kind of book tha At least 3 people I know have told me that this is their favorite book, so I just had to give it a read. It is really, really good. The book follows a young man, Peekay, as he grows up in South Africa in the 30s and 40s. He meets a series of very influential adults and is constantly being shaped by them and also by his many differing experiences growing up. The one theme that stays true throughout is his desire to become the welterweight boxing champion of the world. This is the kind of book that you find yourself not wanting to put down and you miss it when you aren’t reading it. I definitely recommend this book to anyone at all. While I won’t list it as my favorite, it is definitely one of my favorites. What’s not to love about a book about rising up and succeeding and becoming a symbol to all the people ( White, Black, Boers) of South Africa! An uplifting book about a young boy who is tormented at school and whose dream is to become a welter- weight champion. Peekay, the boy, is wise beyond his years. He listens and learns and becomes an instrument of change. A beautiful, heartfelt book that was occasionally bogged down by too much detail, but nonetheless succeeded in all the important ways- a great story that is inspirational and satisfying! I came across Bryce Courtenay through the narrator. I was such impressed by Humphrey Bower performance in Shantaram that I immediately started to look for his other works after I had finished it. It is a fate. Now I'm looking forward to reading more by Bryce Courtenay, because his books are exactly the kind of a life story I am seeking for. The Power of One takes place in South Africa and covers the period of time from the early 1930s up to the late 1940s, the birth of apartheid. It tells a touching and a moving life story of Peekay, an English boy, beautifully written and with a great insight into the cultural background of the country, and a lot of love to the people and the continent itself. Excellent character development and a very strong story-line. Despite my loving of Humphrey Bower narration and his astonishing skills to present all kind of dialects/accents in different voices, I have contradicted feelings about his narrating here. My own fault though. I shouldn't have picked up this audiobook immediately after Shantaram, too strong were the connection of Humphrey Bower to Lin (Shantaram). Lin narrating a five year old boy took some time for me to get used to it. It was a somewhat isolated community and I grew up among farm folk and the African people. At the age of five I was sent to a boarding school which might be better described as a combination orphanage and reform school, where I learned to box - though less I was born illegitimately in 1933 in South Africa and spent my early childhood years in a small town deep in the heart of the Lebombo mountains.